According to the 2011 Index of Economic Freedom, Bahrain has the freest economy in the Middle East and North Africa region  and is the tenth freest economy in the world. An alternative index, published by the Fraser Institute, puts Bahrain in 44th place tied with 7 other countries. Bahrain was recognised by the World Bank as a high income economy. Bahrain's current account balance is characterized by surpluses in merchandise trade and international services, and a large deficit in unilateral transfers, which is accounted for by the country's large expatriate workforce sending home a portion of its earnings. In 2003 and 2004, the balance of payments performance improved due to rising oil prices and increased receipts from the services sector. As a result, the current account balance registered a surplus of US$219 million in 2003 and a surplus of US$442 million in 2004, compared with a deficit of US$35 million in 2002. Bahrain's gross international reserves increased substantially in 2004 to US$1.6 billion, compared with US$1.4 billion in the previous three years (2001-2003). Graphical depiction of Bahrain's product exports in 28 color-coded categories as of 2010. The financial system is enjoying strong performance under favorable circumstances, and is likely to remain a major contributor to overall growth. The main risk stems from potential overheating in the economies of the region, but the system should be resilient to likely shocks. Prudential regulations are modern and comprehensive, and supervision is generally effective, especially in the dominant banking sector. Supervisory capacity needs to be expanded in line with new regulations and to keep up with the growth and increasing sophistication of financial institutions. In 2005, Bahrain signed the US-Bahrain Free Trade Agreement, becoming the first Persian Gulf state to sign such a bilateral trade agreement with the United States. A massive privatization programme is underway to sell off key government assets: utilities, banks, financial services, and telecommunications have started to come under the control of the private sector. As a result, the economy has been well positioned to exploit the extra revenues generated in the region thanks to the sustained high oil prices since 2002. 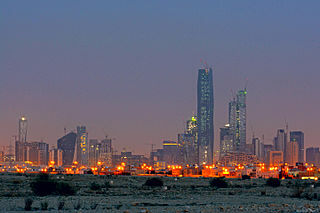 In January 2006, the United Nations Economic and Social Commission for Western Asia cited Bahrain as the fastest growing economy[permanent dead link] in the Arab world. Between 1981 and 1993, Bahrain Government expenditures increased by 64%. During that same time, government revenues continued to be largely dependent on the oil industry and increased by only 4%. Bahrain has at times received significant budgetary support and project grants from Saudi Arabia, Kuwait and the United Arab Emirates. The government has used its modest oil revenues to build an advanced infrastructure in transportation and telecommunications. Bahrain is a regional financial and business center. Tourism, especially from the region, has proved another significant source of income. Bahrain has benefited from the oil boom since 2001, with economic growth of 5.5%. It has succeeded in attracting investment from other Persian Gulf states partly because it used the revenues of the 1970s-early 80s boom to invest in infrastructure development and other projects to improve the standard of living; health, education, housing, electricity, water, and roads all received attention. The success of ventures such as the Bahrain Grand Prix has raised the Kingdom's international profile, and combined with the boom in Islamic banking, has encouraged major airlines to resume services to the country, with Lufthansa announcing on 14 March 2006 that it would schedule three flights a week to Manama from Frankfurt. As part of its efforts to build a modern economy, Bahrain has initiated a series of labour reforms under Minister of Labour Majeed Al Alawi in order to bring the labour market into line with international standards.Bahrain intends to expand its high tech industries, invest in research and development, and strengthen its competitive edge within a global economy. In 2006,it was announced that the Bahrain Science and Technology Park,a Kuwait Finance House Bahrain initiative would be a reflection of this effort to create a diversified economy, provide high quality jobs for locals and international workforce, providing a place for innovative and inventive thinking that will have direct benefits to the island nation. In 2009 it was announced that the Bahraini Government would be developing land next door to the Bahrain International Circuit. The project being managed by @Bahrain is a world-class mix of facilities including a state-of-the-art exhibition and convention facility, a choice of hotel accommodations ranging from mid-market to luxury, a multi-purpose indoor arena, an automotive club and engineering facility, retail and leisure establishments, a tech-tainment (technology interacting with entertainment) centre, a research institute, a technology park and a focus on education and training. @Bahrain is part of the Mumtalakat group of companies and will dedicate more than 1 million square meters of business, entertainment and educational space with a value in excess of $2bn (BD 850 million), making it one of the largest investment projects to take place in Bahrain in the past five years. This is a chart of trend of gross domestic product of Bahrain at market prices estimated by the International Monetary Fund with figures in millions of Bahraini Dinars. For purchasing power parity comparisons, the US Dollar is exchanged at 0.30 Bahraini Dinars only. Mean wages were $19.81 per man-hour in 2009. (PPP) 7.49 Bln. 9.66 Bln. 12.39 Bln. 17.33 Bln. 23.68 Bln. 34.20 Bln. 37.53 Bln. 41.73 Bln. 45.20 Bln. 46.70 Bln. 49.32 Bln. 51.34 Bln. 54.24 Bln. 58.10 Bln. 61.71 Bln. 64.17 Bln. 67.08 Bln. 70.43 Bln. The stock market capitalisation of listed companies in Bahrain was valued at $21,176 million in 2008 by the World Bank. Bahrain is generally a country which is open to creating a unique economy which is fast growing and open for all to create business opporturnities. Petroleum and natural gas are the only significant natural resources in Bahrain. Because of limited reserves, Bahrain has worked to diversify its economy over the past decade. Bahrain has stabilized its oil production at about 40,000 barrels (6,400 m³) per day, and reserves are expected to last 10 to 15 years. The Bahrain Petroleum Company refinery was built in 1935, has a capacity of about 250,000 barrels (40,000 m³) per day, and was the first in the Persian Gulf. After selling 60% of the refinery to the state-owned Bahrain National Oil Company in 1980, Caltex, a U.S. company, now owns 40%. Saudi Arabia provides most of the crude for refinery operation via pipeline. Bahrain also receives a large portion of the net output and revenues from Saudi Arabia's Abu Saafa offshore oilfield. The Bahrain National Gas Company operates a gas liquefaction plant that utilizes gas piped directly from Bahrain's oilfields. Gas reserves should last about 50 years at present rates of consumption. The Gulf Petrochemical Industries Company (GPIC) is a joint venture of the petrochemical industries of Kuwait, the Saudi Basic Industries Corporation, and the Government of Bahrain. The plant, completed in 1985, produces ammonia, methanol and urea for export. Bahrain's other industries include Aluminum Bahrain, which operates an aluminum smelter—the largest in the world with an annual production of about 525,000 metric tons—and related factories, such as the Aluminum Extrusion Company and the Gulf Aluminum Rolling Mill Company (GARMCO). Other plants include the Arab Iron and Steel Company's iron ore pelletizing plant (4 million tons annually) and a shipbuilding and repair yard. Bahrain's development as a major financial center has been the most widely heralded aspect of its diversification effort. International financial institutions operate in Bahrain, both offshore and onshore, without impediments. In 2001, Bahrain's central bank issued 15 new licenses. More than 100 offshore banking units and representative offices are located in Bahrain, as well as 65 American firms. Bahrain's international airport is one of busiest in the Persian Gulf, serving 22 carriers. A modern, busy port offers direct and frequent cargo shipping connections to the U.S., Europe, and the Far East. Internationally recognised Bahraini companies include Investcorp, the venture capital firm credited with turning around the fortunes of Gucci. Taxation and import laws apply equally to Bahraini and foreign-owned companies, and foreign investors must comply with the same requirements and legislation as local firms. Oil and gas companies are taxed 46 percent on income derived from the sale of hydrocarbons and derivative products. There is no personal income tax in Bahrain. (1) for old-age, disability and survivor protection: for Bahraini employees, employers pay 10% of salary plus constant allowances, workers pay 5% plus constant allowances; for non-Bahraini employees, employers pay 3% of salary plus constant allowances (then being entitled only to employment injury benefits). (2) for unemployment insurance: since June 1, 2007, all wages are subject to a 2% tax, paid for equally by the employer and the employee, applicable both to nationals and non-citizens and supplemented by a government contribution of 1%. This makes Bahrain the first of the GCC countries to implement a UI scheme. ^ "World Bank forecasts for Bahrain, June 2018 (p. 152)" (PDF). World Bank. Retrieved 11 September 2018. ^ "Ease of Doing Business in Bahrain". Doingbusiness.org. Retrieved 2017-11-24. ^ "Export Partners of Bahrain". CIA World Factbook. 2016. Retrieved 2018-03-09. ^ "Import Partners of Bahrain". CIA World Factbook. 2016. Retrieved 2018-03-09. ^ "10 Most Expensive Currency In The World - Latest News Online, News, Fresh News, Online News". Retrieved 3 March 2015. ^ "Bahrain calling – Banking & Finance". ArabianBusiness.com. 25 April 2008. Retrieved 27 June 2010. ^ a b "CIA World Factbook, "Bahrain"". Cia.gov. Archived from the original on 29 December 2010. Retrieved 25 January 2011. ^ "Gulf Daily News » Business News » Jobs 'for generations to come'". Retrieved 3 March 2015. Kingdom of Bahrain, Ministry of Labour Unemployment Insurance System. Accessed November 6, 2007. The United Arab Emirates is a country at the southeast end of the Arabian Peninsula on the Persian Gulf.